Melbourne aikido instructors Mal McRae and Peter Lindsay have joined forces in McRae’s Ki Fusion organisation, which counts martial arts legend Bob Jones among its students. 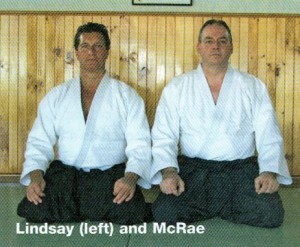 McRae, a student of Sensei David Brown for 25 years before founding Ki Fusion in 2001, has been training Zen Do Kai founder Bob Jones and some of the Bob Jones Corporation’s most senior martial artists for several years. Jones, a martial arts pioneer and veteran of the security business, has trained extensively in karate, Muay Thai, Filipino escrima and a host of other styles now taught by the BJC. He was introduced to aikido some five years ago and since then has trained in the art several times a week, also adopting its principles — for which he’s coined the term ‘EPC’, meaning Enter, Pass, Control’ — into the Bob Jones Martial Arts syllabus. Jones has spoken to Blitz on a number of occasions about the benefits of McRae’s aikido training — and Lindsay, a former bodybuilding champion, says he’s not surprised. For more info, check out the website at www.kifusionaikido.com. A feature on the Ki Fusion form of aikido and Bob Jones’ involvement will also appear in an upcoming issue of Blitz.